Home » English » Please organize ! 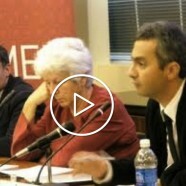 On november 18, 2011, the Project on Middle East Democracy (POMED) organized a conference in Washington DC titled “Beyond Morocco’s elections: prospects for genuine reform?”, featuring scholars Marina Ottaway, Anouar Boukhars and Ahmed Benchemsi. In an interview with Morocco Board Service (starting 3:59), Benchemsi insists on the crucial necessity for Feb20 pro-democracy movement to organize, elect leaders and establish an agenda, if it ever wants to prevail over the autocratic regime. Before that interview, Benchemsi gave a more general address on the forthcoming 2011 elections (video below). Bad point: he didn’t foresee the Islamist party’s electoral foray that ensued. Good point: he was right predicting that whatever the result, the monarchy would remain in command anyway. Salut Monsieur Benchemsi. Je crois que le problème qui se pose c’est que le 20 feb n’as pas vraiment une idéologique commune à tous ses militants. ça va du nationalisme à l’extrême gauche, donc s’organiser dans un parti, c’est pratiquement impossible.